Startup is not everyone’s cup of tea. Being an entrepreneur is highly demanding. You’ve to be efficient at every step. And financial management for startups isn’t one of fascinating part for it. Unless you’ve an investor who is ready to fund all your requirements you have to optimize your cash inflow and minimize the capital cost on your own. Owing to fluctuations in payables and receivables it is very difficult for startups to predict their short term assets. If you are of the view that only a great idea is what makes a startup successful, let me break it to you, you’re mistaken. Money does matter. By money I don’t mean funds in your bank account. It is a common practice that when someone starts their own business they focus on their products and services and tend to ignore the financial matters. Managing insights of your company’s finance might seem an exhausting task, but it will benefit you in the future for sure. You need to get your priorities straight before you seek help from investors. Ask yourself, how much money do I really need? What’s the valuation of my equity? Do I have the assets required to run the business? Will any of my colleagues, family or friends invest in my business? Do I have open credit lines available? Once you begin your journey with bits and pieces, you’ll reach a point of saturation where you’ll need some sort of funding. 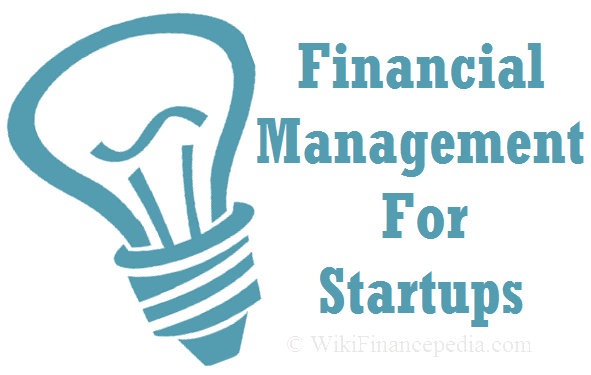 Let’s check out the sources that might help you in financial management for startups. Equity investment is a kind of investment where you receive funding from some established firm or an individual in exchange of the shares your venture. Government Grants are the best sources to meet your startups’ financial needs. You are provided with required cash for absolutely free of cost. Banks will readily offer you loan depending on your idea and the potential they see in you. Commercial loans are further divided in two categories. 3.1 Short Term Loans: These loans are offered to manage your day to day expenses, for example buying inventories, paying bills etc. Credit cards and Debit cards are used for this purpose. They are subjected to higher rate of interest. 3.2 Long Term Loans: To finance your heavy expenses or fixed assets, banks offer you long term loans for period of two years, five years etc. They secure the loans by collateral. The above mentioned sources are traditional ways to fund your start up. Chances are that none of the sources entertain you, but being an entrepreneur you have no limitations and obligations in gathering fund for your business. You are free to think out of the box. For example you can participate in contests launched for the very purpose of funding startups. Amazon and MIT host such contests annually. In the age of internet you can always seek help online. Here’s the list of online financial management tools used by startups to optimize their financial status. 1. Salesforce Invoice and Payment Platform – Tracking invoices and payment statuses is very crucial for startups owners. Salesforce in collaboration with Taulia has brought this new tool that not only lets you track your invoices but also choose early payment options. This integrated platform is free to use. This is one of the important tool of financial management for startups. 2. BodeTree – This tool tracks your business’s finances regularly. Cash tracker, is their advanced feature that helps you in visualizing your income, expenses, and profit. Financial insights can be viewed and managed with the help of this tool. It helps you set goals, calculate your company’s valuation, industry comparisons, and build a strategic roadmap that covers a number of areas of building a successful business. 3. Bench – This online bookkeeping service equips you with its own personal professional bookkeeper. Free paperless bookkeeping that keeps a record of bank level security of your financial information, and tax time support to help lower your business-related stress levels can be availed with Bench. In this e-learning tutorial course you have very well learned that successful startup doesn’t mean a great idea but it requires lot of proper financial planning to make it successful. Financial management for startups are as important as startup ideas.